Health Fair Connections | How do I get into the health fair? As you can see above in the snapshot of a host's dashboard, you have to be selected to attend by the host (aka someone from the HR team) at the organization/company hosting the health/wellness fair. Meaning, you can't just get on the interested vendor list and assume you're going to be able to attend the health/wellness fair. The process works by you first, going to the event page and clicking, "join list of interested vendors." This list of interested vendors is the list the host will review and select the vendors they want attending their health/wellness fair. By the way, you can get on this list for free. But remember, you could be denied by the host as well. HFC does not/can not guarantee you'll be accepted to the health/wellness fair once you join the list of interested vendors. Step 3. Click, "join the list of interested vendors"
You'll also be emailed if you're denied (hopefully, that doesn't happen). A free (basic) ad or a paid (premium ad). 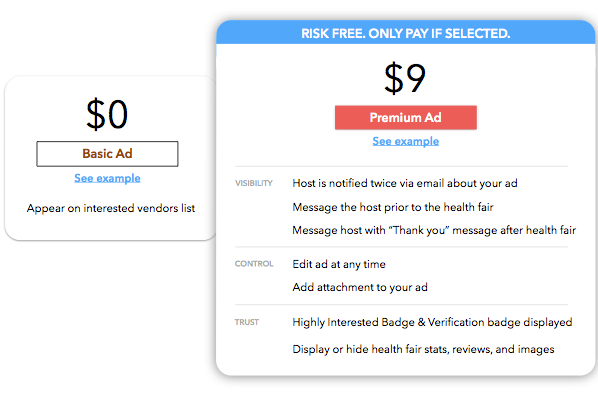 The premium ad provides additional value and increases your chances of getting selected by the host. It all depends on how much free value you'd like and if you would like to increase your chances in the health fair. 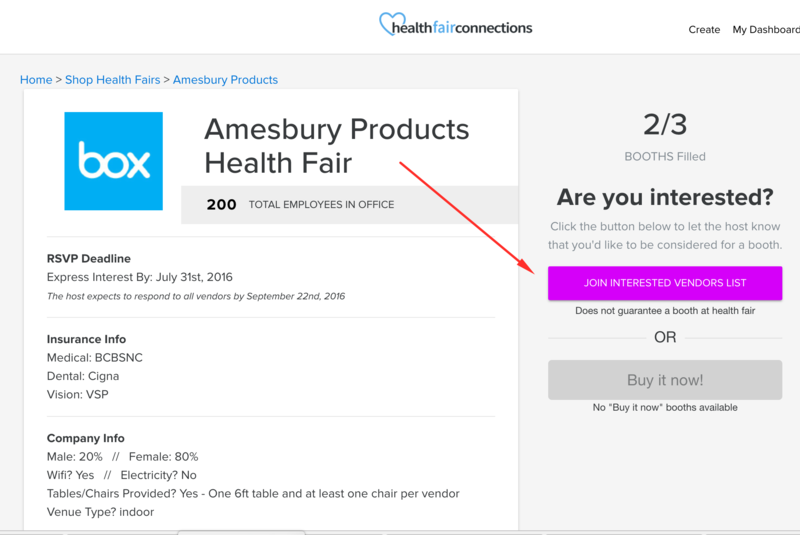 On Health Fair Connections (HFC) - there's no buying booth spaces in the health/wellness fair. We give the host full control over which vendors they would like to attend their health/wellness fair. We hope this breakdown helps.